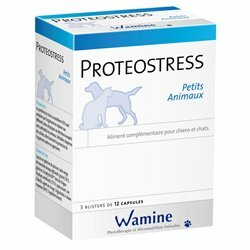 Treatment in dogs and cats. For the warnings, the precautions and cons-indications, see the instructions for use . 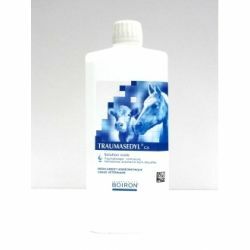 IN TRAUMATOLOGIES treatment in horses, cattle, sheep, goats, pigs, dogs and cats. 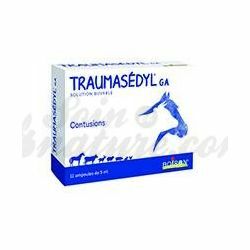 Homeopathic medicine traditionally used in trauma: contusions, bruises, sprains and their sequelae. This drug is not an anti-inflammatory. Arnica montana CH 4, Bellis perennis CH 4, CH 4 perforateum Hypericum, Ledum palustre CH 3, CH 4 Rhus, Ruta graveolens 4 CH aa. List of excipients: ethanol 15% V / V.
Indications: horses, cattle, pigs, sheep, goats, rodents, rabbits and birds. 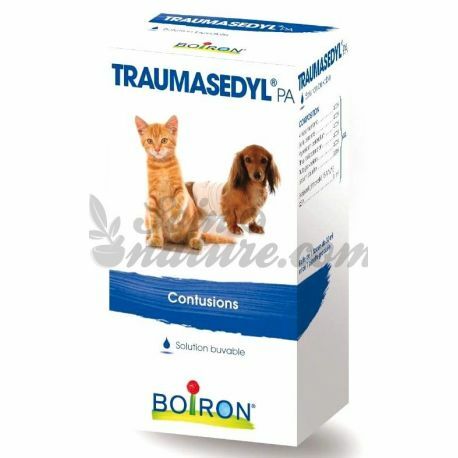 How to use Traumasedyl PA oral solution? recognized by the homeopathic materia medica. MARKET: Box of 1 bottle of 30 ml graduated pipette and 1: FR / V / 7264551 8/2000. 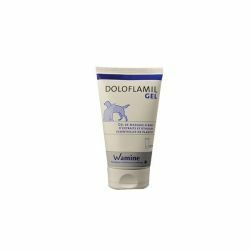 Veterinary medicinal product not subject to prescription. Attention, the drug is not a product like any other. Read the package leaflet before ordering. Do not let the drugs out of reach of children. If symptoms persist, seek the advice of your doctor or pharmacist. Beware of incompatibilities on your current products. Please tell your online pharmacist ongoing treatment to identify any incompatibilities. The order confirmation form contains a custom message field provided for this purpose. Click here to find the manual for this product on the website of the National Agency for Drug Safety and health products. Homeopathy and influenza, colds, cough, sore throat, hoarseness ... Specialist in the manufacture of homeopathic medicines, the French Laboratory Boiron has acquired a unique know-how in the production of homeopathic medicines, the fruit of more than one half century of experience and innovation in pharmacy. Homeopathy and mild anxiety, spasms, restless sleep, nervousness, stage fright, apprehension ... The manufacture of complex homeopathic medicines meets some of the most stringent pharmaceutical and regulatory requirements in the world. Homeopathy and Blues, bumps, body aches, dental flare, menopausal disorders ... Building on the strengths of homeopathy, BOIRON complex homeopathic medicines provide simple, effective, fast and easy to use. access, available only in pharmacies, with the advice of pharmacists. Homeopathy can help your pet to relieve many pathologies, whether physical or mental. Stress, trauma, itching, stress, vomiting ... it can also intervene in complementary treatment. Discover the homeopathic remedies that will relieve your dog or cat. The remedies used in veterinary homeopathy can be based on plant products (eg chamomile, arnica ...), animals (cuttlefish ink, cobra venom ...), minerals (silica, calcium ...) and chemicals (hydrochloric acid, copper ...) . The malady : homeopathy does not treat diseases, it treats the patient that is to say that we will take into account the animal as a whole (psyche, physical and antecedents) and not only symptoms. The similarity : we will administer to the sick animal a substance that would cause the same symptom in a non-sick (healthy) animal, but which will have the effect of healing the patient. Dilution : it is a question of using a toxic substance with infinitesimal dose, it will have the effect of healing and not of generating symptoms. For example, the nux vomica is a fruit having the effect when ingested to cause vomiting, however after dilution and dosed at 5CH, the active ingredient Nux vomica will have an anti-emetic effect. 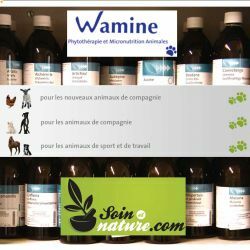 When you visit a homeopath veterinarian, the consultation will be much longer than a conventional consultation, because it will have to take into account the animal, its behavior, its tastes ... and not just the treatment of symptoms. Do not hesitate to ask your pharmacist for advice via our secure form .